Emmanuel Tzanes was an Orthodox priest and famous iconographer who worked in Crete and also at times in Venice in the mid-17th century. 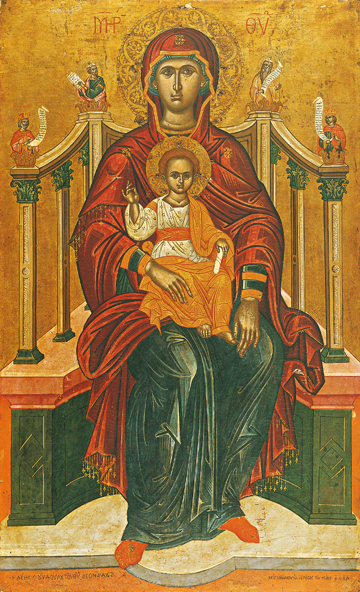 This icon was painted in Venice in 1664 for the iconostasis or icon altar screen of the Church of St. Andrew in the Monastery of St. Philothea in Athens. The Virgin is seated on an elegant marble throne with the Lord of Lords seated on her lap blessing all of the Faithful. He holds a prophet’s scroll to indicate that He has fulfilled all of their prophetic words concerning Him that they wrote by Divine inspiration. Above and on the corners of the throne are pictured the Prophets David, Solomon, Moses and Aaron hymning the Virgin with psalms of praise and prophesy. “Theotokos” is the Greek term for “Birth-Giver of God” and the most common name used for the Virgin since the Third Ecumenical Council in a.d. 431, where this use was proclaimed to support the correct understanding of the Incarnation of Christ in the flesh. This icon matches one of Christ (our J09) made for the same iconostasis at the same time. There is a majesty serenity and nobility expressed in these wonderful icon masterpieces.